We have the widest selection possible of Chuck Kraft's fly patterns, which constitute most of the former Kreel flies. Chuck's patterns include the Kraft Kreelex, the CK baitfish and the Kraft Clawdads which are in stock. Chuck Kraft is a renowned fly fishing guide and fly designer in the mid-Atlantic. I started fishing with Chuck as a client back in 1989, and much of what I learned about fly fishing I (and many others) owe to Chuck. The Clawdad represents a crawfish and is extremely effective on large rainbow and brown trout and smallmouth bass. Place your order with us now as we ship on a first-come, first served basis and will advise you if any patterns are out of stock. Kreelex and baitfish are both deadly imitations of forage fish. The Kreelex has worked on huge browns and rainbows from Chilean Patagonia to cutthroat on the Elk in BC, and many places in between including Virginia brook trout. Chuck used this with success in the One-fly tournament a few years bask. The CK baitfish or Kraft Minnow works on striped bass, large rainbow and brown trout, smallmouth and largemouth bass, false albacore, and about any species looking for a fat meal. 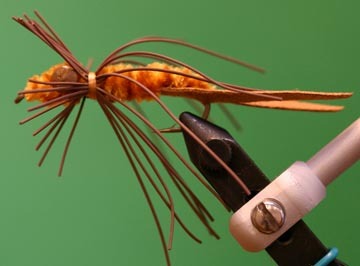 We also have Chuck's original nymph pattern, the CK nymph in stock and available. Great caddis imitation which has been outstanding from Montana's Clark Fork to Virginia's Jackson River. We receive questions occasionally regarding the Spoon Minnow (aka the Paradox), a former pattern of Kreel. The founder of Kreel is negotiating with a the supplier for the production of this pattern. We do not know when Spoon Minnows or Paradoxes will be available, but are staying on top of the situation and expect to have them as quickly as anyone. To be first in line for them, please contact us so that we have your email on file and we will let you know as soon as these patterns are available. Tying materials for many of the Kraft or former Kreel patterns are shown below. Contact us or call us at 434-385-0200 if we can help you with any questions.